Paul and Jarrod Lindemann are both fourth generation, commercially rated pilots who got their start in aviation and flying at a very young age. They grew up around a variety of aircraft, being active in the family aviation business. They both gained experience helping their dad, the late Dan Lindemann, with crop spraying in the summer months and aircraft maintenance in the winter months. Paul and Jarrod have thousands of hours logged in various aircraft and are both Airframe & Powerplant certified mechanics. Paul’s aerobatic performance includes a Pitts S-2B, a 1985 two-place that was factory built in Afton, Wyoming. It’s running a fuel injected 540 cubic inch Lycoming engine and spins a three blade MT propeller. This Pitts was originally blue and white, but in 2012 the Lindemanns fully restored, recovered and painted it a new green, black and white paint scheme. 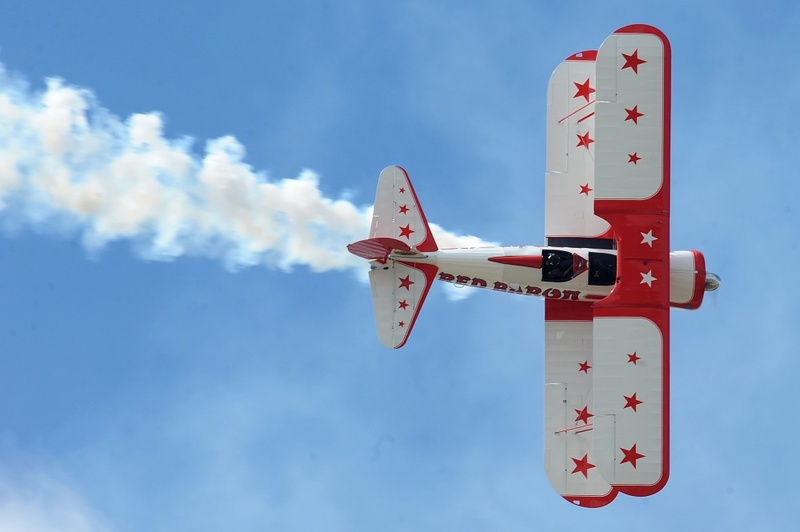 Jarrod’s aerobatic performance showcases the Red Baron Stearman which was originally No. 5 of the aerobatic Red Baron Squadron team. This particular Stearman was with the squadron for the entire 28 years that the team performed in airshows and flew the lead at one time. This 1941 biplane was fully restored by the Lindemanns, taking a total of 11 months to finish the project.